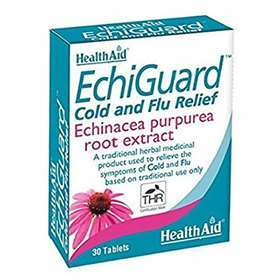 HealthAid EchiGuard Cold And Flu Relief tablets are a traditional herbal medicinal product which is used to help shorten the symptoms of cold and flu. EchiGuard also contains anti-Inflammatory and antioxidant properties which helps combat seasonal allergies. Useful for colds and upper respiratory infections. Helps fight fatigue and stress. Take 1 tablet, three times a day, if required. Do not use if you are allergic to Echinacea, other members of the Daisy (Asterceae/Compositae) Family or any of the ingredients. If your symptoms worsen or persist for more than 10 days see your doctor or pharmacist. This product is not suitable if you are under 12 years of age, pregnant or breast feeding. 143.0mg of Extract (Dry Extract) from Echinacea Purpurea Root (6-7:1) (Equivalent to 858mg ? 1000mg of Echinacea Pupurea (L.) Moench, Root). Extract Solvent: Ethanol 30% v/v.